Dining out in South Jersey has never been better. As our area’s older restaurants continue to secure their places in history with familiar but unforgettable meals, newcomers are stepping up their game and presenting us with some of the most innovative and exciting dishes we’ve seen. Some might think that makes the task of selecting our annual Golden Fork Award winners easy, but trust us when we say it’s only made our job tougher. We spend all year scouring South Jersey to find the dining rooms, dishes and service that are truly special. So allow us to present the 25 best fine dining destinations in South Jersey, restaurants that satisfy with every bite yet keep us hungry for more. We’ll share the dishes you have to try, the drinks to match and some insider tips we’ve picked up over our visits. Restaurants like these are proof that you never have to go too far to indulge in some top quality food made with experience, determination and most of all, love. This still-young restaurant is drawing crowds from across South Jersey, thanks to a light, fresh and clean approach to Italian cooking. The bright and welcoming space is intimate and inviting, while the evolving menu continues to catch our eye. 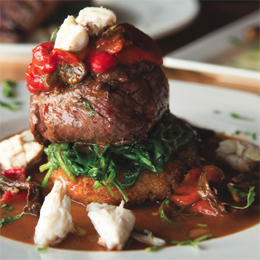 ORDER THIS: Grilled filet mignon, which comes finished with lump crabmeat, roasted red peppers and porcini mushrooms, served with a crispy risotto cake and sautéed spinach. ? PERFECT FOR: All ages, as the menu offers something for everyone, including classics like chicken parmesan and pastas alongside more sophisticated entrées for pickier palates. EXTRA BITE: Chef and owner Mark Berenato closed his longstanding Haddonfield dining room Da Soli to focus his full attention on Allora, and the kitchen and its fare seem to be only getting stronger. The P.J.W. Restaurant Group’s lavish steakhouse dishes out only the finest cuts of beef, including in-house, dry-aged strip steaks with enhancements, sauces and rubs designed to elevate the classic steak to new heights. A fresh raw bar and seafood selection round out a menu that’s focused but still diverse. ORDER THIS: You can’t really go wrong with any of their steaks, but don’t overlook the shellfish, like their scallops coated in a porcini mushroom dust, served with whipped cauliflower and shiitake mushrooms, all drizzled with a nutty brown butter. ? SOMETHING TO DRINK: Head out to their al fresco bar space to truly enjoy their vast cocktail menu, which includes the ChopHouse martini, made with a pineapple-infused vodka. EXTRA BITE: The ChopHouse menu has been expertly crafted by longtime executive chef Markese Beverly, who offers selections that are classic and still innovative. Route 70’s iconic Italian hot spot has nearly 30 years of experience, drawing a fan base that returns consistently for their rotating seafood menu, impeccable wine list and Italian cuisine with a modernist touch. ORDER THIS: Whole fish options—which change seasonally, with a variety of preparations—provide both dinner and a show as they are served and filleted tableside by expert hands. SOMETHING TO DRINK: Caffe Aldo’s bar has become a happy hour hot spot, thanks to specialty cocktails like the Barrel-Aged Vesper, featuring Ultimat vodka, No. 209 gin and a dash of the aperitif Lillet Blanc. PERFECT FOR: Business people all across the area have made Caffe Aldo’s upscale setting the scene for corporate lunches, networking dinners and more. Chef and owner Nunzio Patruno has poured his life’s passion into his Haddon Avenue eatery over the course of two decades, crafting pasta, veal, seafood and poultry dishes that go beyond Mediterranean to become comforting, masterfully crafted plates. ORDER THIS: The Salmone alla Griglia starts with a hearty filet of salmon, herb-crusted and grilled, which gets finished with fresh, diced tomato and basil ribbons with just a dash of rich olive oil. PERFECT FOR: Family get-togethers, which are made all the more easy with a selection of private dining space and specialty menus for large events. Mother and son duo Cindy and Kenneth Sze add their own artisanal flair to traditional Japanese food, including sushi, hibachi and kitchen preparations unlike anything in the area.? ORDER THIS: Miso Chilean sea bass is a traditional Japanese dish known for its difficult execution, and done quite right here, as filets of white fish are slow cooked in a house-made miso glaze, then served alongside Shanghai cabbage—or bok choy—gyoza and fried rice. ? SOMETHING TO DRINK: It’s difficult to choose just one drink from the bar, as each are handcrafted by Kenneth Sze himself, though the lychee martini, with Ketel One vodka, sake and lychee liqueur, remains a standout. ? EXTRA BITE: Be sure to approach a member of the Sze family to truly talk shop before ordering your sushi; their commitment to the freshest seafood means that his selection changes every day. Now in its 14th year, chef and owner Franco Lombardo continues to produce a refined and authentic Italian menu in a space that feels warm, familial and comfortable.? ORDER THIS: Sweet and savory combine in the Braciola di Pollo, which stuffs a chicken breast with cantuccini—or Italian almond biscotti—diced butternut squash, fresh sage, provolone cheese and pancetta before baking it slow in a lemon, sage and butter sauce. ? SOMETHING TO DRINK: This BYOB has a partnership with Franklinville-based Coda Rossa Winery, serving up bottles of New Jersey crafted wines to pair with your plates. EXTRA BITE: Walk by the restaurant in the summer and you’ll smell the scent of fresh herbs. That’s because Lombardo and his kitchen grow and pick a selection of their produce straight from their garden boxes, including basil and tomatoes. Living so close to the Shore comes with plenty of perks, one being the seafood that comes right to our doorsteps. Fischer’s has been making the most of fresh seafood for years, and works with only the finest local purveyors to find the products that make it to your plate. ORDER THIS: A filet of crispy skin bronzino comes with blanched haricot verts, tomato risotto and house-made lotus root chips.? PERFECT FOR: Fans of adventurous and classic seafood dishes, as the kitchen puts out things you recognize like mussels and blackened salmon while also taking an Asian twist with miso and sesame-crusted Ahi and a tuna and avocado martini. EXTRA BITE: A commercial fisherman, chef Bill Fischer knows his seafood intimately. Chef and restaurateur Jose Garces elevates Mexican cuisine to new heights in his Moorestown Mall space that’s packed with fun and excitement. The space itself is bursting with color, while the menu comes alive with the help of Mexican standards prepared with care. ORDER THIS: Think of their huaraches almost like a Mexican pizza, which starts with a maza dough base and builds from there. The shrimp huaraches is topped with sautéed shrimp, crispy chorizo, queso mixto cheese, fresh jalapeño and a slathering of pasilla chile sauce. ? SOMETHING TO DRINK: Unleash your wild side with the el tigre de oro margarita, a golden blend of pineapple, watermelon and fresh lime, topped with more fruit that’s been infused with Sauza Blue tequila. Our Best New Restaurant winner of 2016 continues to make our mouths water, featuring handcrafted pastas, risottos and specialty menus that change not just season- ally, but almost weekly. ? ORDER THIS: While you’re bound to find something new every time you walk in, the slow-roasted beef short ribs braised in red wine are a popular selection; tender and falling apart alongside seasonal vegetables. PERFECT FOR: Lovers of truly authentic cuisine could get lost inside this restaurant for a few hours, as co-owner Kevin Maher spent several years cooking his way across Italy. EXTRA BITE: Maher’s perfectly cooked pasta stems from three years of cooking at Milan’s Il Luogo di Aimo E Nadia, an institute in the city that dates back more than half a century. Scarpinato’s packs in return customers and familiar faces night after night in search of Italian dishes that have become an engrained part of our culture. ORDER THIS: The namesake Cavatelli Scarpinato, tossed in garlic and olive oil with skinless pork sausage, peppers, black olives and freshly diced tomatoes. PERFECT FOR: Looking for a little bit of Sunday gravy without the hours in the kitchen? Get in line for a table here. Café Madison remains one of our favorite indulgences, thanks to a French-focused selection of dishes and a wine menu to match. Take your pick from an opulent four-course meal, or go à la carte to enjoy seasonal specials and dishes that change with the weather. ORDER THIS: Dayboat scallops, which come seared and served with a creamy and rich mushroom risotto drizzled with a port sherry reduction. ? SOMETHING TO DRINK: There are plenty of different spots in the building to grab a drink, but we like grabbing a seat and sip—like the Black Widow martini with cherry vodka, chocolate liqueur and vanilla—at the Martini Bar. PERFECT FOR: An unforgettable date night is easy in such an upscale, elevated space. The touch of truly professional servers makes it feel like a night out in the finest Parisian restaurant. Family style is the name of the game at Catelli Duo, which serves up Italian-inspired plates along with wood-fired pizzas, grilled meats and seafood and tons more off their sprawling and expansive menu. ORDER THIS: The signature house meatball is our guiltiest guilty pleasure, made with a full pound of ground Kobe beef and veal. It’s stuffed to the brim with melty Scamorza cheese and smothered in handmade tomato sauce before being finished off with ricotta and served for a group. SOMETHING TO DRINK: Along with a well-defined and enticing wine menu, the bar features a selection of craft beer and cocktails like the Pain Killer, made with Pyrat XO rum, orange and pineapple juice, cream of coconut and a sprinkling of grated nutmeg. EXTRA BITE: The newest Catelli Duo has opened in the Moorestown Mall, replacing Marc Vetri’s short- lived Osteria. It doesn’t get more grandiose than this Cherry Hill Mall steakhouse, an old school and ultra elegant restaurant that takes meat seriously. On any given night you can rub elbows with local celebrities and pro athletes, all there for the best in traditional steakhouse fare, with top-notch servers and a stunning bar to boot.? ORDER THIS: All steaks are dry-aged in-house, like their New York strip au poivre, cooked to your liking and served with a helping of rich Courvoisier and peppercorn cream sauce.? SOMETHING TO DRINK: The Blackberry Bourbon Sidecar blends sweet with smoky thanks to small-batch Woodford Reserve, fresh blackberries, thyme, lemon juice and a splash of Cointreau. ? PERFECT FOR: You’ll get the A-list treatment when you want to celebrate a truly special occasion, including advice from their sommelier, professional service and even a souvenir photo to take home. The stunning dining room at Estia in Marlton is more than enough to draw diners through the door, but its impressive bar selection and artfully crafted Greek appetizers and entrées keep guests returning again and again. ? ORDER THIS: The surf and turf plate allows you to customize your choice of shellfish and protein, but we suggest their jumbo African prawns paired with beautiful grilled lamb chops, served with tangy tzatziki, fried potatoes and a side of arugula salad. SOMETHING TO DRINK: We appreciate the bar’s playful wink at Greek history, as shown in their drinks like The Wooden Horse, designed to wipe out competitors with Cimarron-brand reposado tequila, Framboise liqueur, fresh lemon and a kick from house-prepared chipotle syrup. PERFECT FOR: Travel enthusiasts and adventurers alike will fall for the warm, undeniably Mediterranean vibes in Estia. The clean, white setting and quintessential Greek preparations are like an instant escape to Mykonos or Santorini. At just 35 seats, this Sicilian BYOB is small but mighty, filling up night after night thanks to the finest quality ingredients prepared with an eye on tradition. Head chef and owner Joe Baldino pays homage to his roots with a simple, but complex selection of pastas, seafood and specials. ORDER THIS: Honestly? It’s hard to choose just one dish. But we try not to leave with- out a plate of spaghetti vongole, featuring hand-made pasta sautéed with fresh cockles and top quality Sicilian extra virgin olive oil. ? PERFECT FOR: Foodies flock here, as it’s earned a reputation among chefs up and down the coast as one of the best Sicilian restaurants out there. You may even rub elbows with local celebrity chefs like Marc Vetri and Nicholas Elmi.? EXTRA BITE: Baldino has been nominated four consecutive times for the James Beard Award for Best Chef in the Mid-Atlantic. Semifinalists for 2017 are expected to be announced this month. The Farm & Fisherman Tavern ? While the words “farm-to- table” have been buzzing all over the culinary industry, few spots have really embraced the concept like Farm & Fisherman. Their seasonal menus pull produce, proteins and even libations from all over the tri-state area.? ORDER THIS: Chicken baked in hay is rustic but still refined, coated in a masala spice, drizzled with spiced mushroom jus and plated with a creamy chard and potato gratin.? SOMETHING TO DRINK: Like the rest of the menu, locally sourced cocktails change with the season, but the Moriuchi Appletini—made with Philadelphia’s Stateside vodka, simple syrup and fresh cider—is a great way to warm up this winter.? EXTRA BITE: Owners Josh and Colleen Lawler made the decision to close their original Philadelphia location to expand upon their South Jersey roots last February, so look for even bigger things in 2017. Indian cuisine remains a rising star in South Jersey dining, thanks largely to the foundation that Coriander has built as one of the best Indian restaurants in the area. The kitchen strives to tweak traditional Indian with the help of modern preparation and exciting twists. ? ORDER THIS: Dal Makhani is a dish that takes hours to get right, using black lentils stewed over an open flame overnight with a variety of spices and served with basmati rice.? PERFECT FOR: Vegetarians looking for variety can rejoice, as dozens of options are available without even needing substitutions or changes. Gluten free options abound as well. INSIDE INFO: Chef Vipul Bhasin is rolling out a new chef’s table, an interactive evening where diners can learn all about what goes into their dishes straight from the source. We were thrilled when Philadelphia Szechuan chef Han Chiang brought his spice-packed cuisine across the bridge into Cherry Hill, and five years later Han Dynasty is establishing itself as a local institution, perfect for the boldest palates. ORDER THIS: The dry pot style entrée—available in chicken, pork, beef, fish, lamb, shrimp and even rabbit— delivers a sizzling miniature wok tableside, packed with spicy hot pot sauce and tossed with black mushrooms, diced bamboo shoot and Sichuan peppercorns for a bit more heat.? PERFECT FOR: This spot is a spice lover’s dream, as almost every dish on the menu packs a fiery punch from start to finish? EXTRA BITE: The more timid taste buds can work with their server on creating a slightly less spicy dish. Tucked into a quiet section of Broadway, Speranza is a modern and eclectic space that merges Italian with modern American cuisine. The restaurant takes pride in their wood-fired oven, which serves up a variety of pizzas, pasta bakes and even meatballs. ORDER THIS: Speranza’s gorgonzola-crusted bistecca starts with a 12-ounce New York strip, topped with gorgonzola cheese and served atop a potato, caramelized onion, spinach and bacon hash with a finishing touch of crispy fried onions. PERFECT FOR: This is a truly all-ages space, thanks to pastas and wood-fired pizzas. There’s also a kids’ menu for the little gourmands. You’ll never have the same experience twice at Giumarello’s, and that’s because they dedicate so much time to making sure what is coming into their kitchen is fresh and interesting. Their raw bar is known all over the area, as is their selection of nightly specials including fish of the day offerings and other specialty proteins. ORDER THIS: Their dish of maple glazed salmon warms you all the way to the soul, served flaky and tender with a puree of sweet potatoes and sautéed spinach tossed with garlic and olive oil.? SOMETHING TO DRINK: The cocktails coming from the popular G Bar are known for their creativity. For proof try the Natalie’s Spicy Unwinder, made with jalapeño-infused tequila, St. Germain liqueur, simple syrup and fresh-squeezed lime. This sprawling South Jersey space offers a variety of settings all in one spot, with spacious dining rooms designed to reflect the opulence of Italian cuisine. The rustic Italian cuisine meets a modern flair with classic meals and others that will take you on an all-new journey. ORDER THIS: A generous rack of lamb is crusted in a Dijon-rosemary breadcrumb mix, cooked to perfection and served along with a port demi glace, garlic mashed potatoes and asparagus. ? SOMETHING TO DRINK: We suggest trying anything from their generous wine menu, including single glasses and bottles of red, white and rosé that will perfectly pair with your meal. Kitchen 519 has gained a solid reputation thanks to a modernist menu that puts a totally unique spin on American food. Offering everything from upscale sandwiches and entrées to grilled steaks and an extensive vegan and vegetarian selection, the options here are diverse and always exciting. ? ORDER THIS: It’s hard to find duck on menus around here, and Kitchen 519’s chocolate peppered duck breast kicks it up a notch, thanks to spice from the Turkish pepper urfa biber and crushed cacao. SOMETHING TO DRINK: The kitchen can help pair your meal with wines from Bellview Winery in Landisville, which is the restaurant’s winery partner. PERFECT FOR: A night with friends. The fun and funky atmosphere, paired with what we can only describe as a selection of modern comfort foods, make this a place to enjoy with enjoyable company. This is one of the grander dining rooms in the area, and its accompanying Italian plates—from appetizers and entrées to pastas and sides— match that luxurious feeling. ? ORDER THIS: Spoil yourself with the monster veal chop, 12 ounces of bone-in veal grilled and served with a rich, earthy mushroom demi glace, potatoes and sautéed broccoli rabe.? PERFECT FOR: Large groups won’t have to worry about finding a seat at the table here, thanks to three massive dining rooms and a private event space that can fit a total of almost 200 people.? EXTR BITE: For the best seat in the house be sure to request a spot in The Main Room next to their warm and toasty wood fireplace. This family-run Italian hot spot made the move from Philadelphia to Camden County 12 years ago, and has established itself as a top quality restaurant with traditional Italian and Italian-American recipes. Their multi-course menu is built to please all ages, and includes an impressive selection of in-house desserts and cakes. ORDER THIS: Decadent cannelloni pasta is stuffed with chopped, lump crab and ricotta cheese, then drowned in a creamy Béchamel. SOMETHING TO DRINK: Tre Famiglia may be in dry Haddonfield, but it partnered with Hammonton’s award-winning Sharrott Winery for customer convenience. The Fieni family wears their more than two decades in service as a badge of pride, presenting their guests both new and old with family recipes passed on from generations ago. The names of the plates may sound old school, but it’s the experience and passion behind each dish that truly sets them apart. ORDER THIS: Fieni’s fettuccine alfredo isn’t what you’re used to: They pair their noodles and creamy white sauce with sautéed spinach and lump crabmeat for a bit of color and an added punch of natural flavor.? EXTRA BITE: Appetizers can also be pre- pared family style, in larger portions designed for sharing. With a raw bar, killer mussel options and more great seafood, this historic spot never disappoints. The hefty plates of Italian favorites coming out of this kitchen attract a loyal contingent of diners. Megu Sushi | Cherry Hill and Moorestown ? Inventive signature rolls, a solid offering of entrées from the kitchen and topnotch hibachi keep this Japanese restaurant high on many people’s list. What this cozy restaurant lacks in space it makes up for with big flavors, creative plating and attentive service. Part Italian restaurant and part sushi bar? Trust us, it all works well. 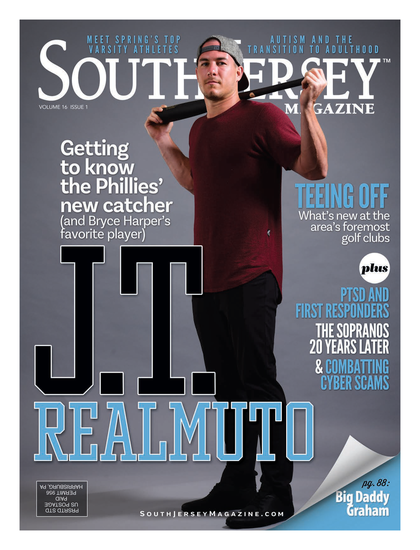 Published (and copyrighted) in South Jersey Magazine, Volume 13, Issue 11 (February, 2017).